DIRECTOR’S BIO – Eben Skilleter is an independent filmmaker based in the United Kingdom. He makes quality shorts for film festival submission. 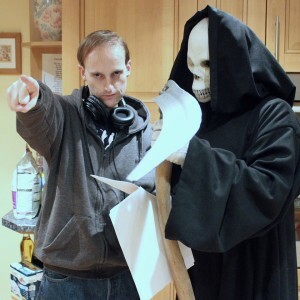 Brian & the Grim Reaper was his first short film and was accepted at 6 film festivals. To date he has received 17 film festival acceptances. He worked on four short films in 2016 alone and is currently in pre-production on his biggest one yet! Eben hopes one day to direct feature films. – Boxes (2018) – Short Film – accepted at 4 film festivals, winning two! Eben is the son of renowned Jaguar Cars historian Paul Skilleter, whose company he works for. Contrary to popular belief, his first name isn’t Welsh in origin. It can be found in the Old Testament. Eben’s directing debut was a one-act play that he also wrote entitled My Zombie Grandpa. It featured an octogenarian in the title role.